3 Core 3 Pin Power Cord & Temperature Display. Cord winding station at Rear. Tank Cover, Auto Swing & Ice Chamber. Dust Filter Net, Ice Bag & 4 Way Air Deflection. Low Water Alarm & Timer. Auto Display Off Function (Remote). Water Level Indicator & Humidity Control. 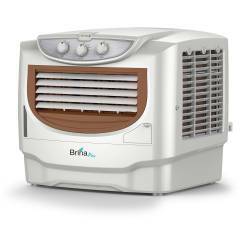 Havells Brina Plus 50 Litre Window Coolers, GHRACBPC230 is a premium quality Air Coolers from Havells. Moglix is a well-known ecommerce platform for qualitative range of Air Coolers. All Havells Brina Plus 50 Litre Window Coolers, GHRACBPC230 are manufactured by using quality assured material and advanced techniques, which make them up to the standard in this highly challenging field. The materials utilized to manufacture Havells Brina Plus 50 Litre Window Coolers, GHRACBPC230, are sourced from the most reliable and official Air Coolers vendors, chosen after performing detailed market surveys. Thus, Havells products are widely acknowledged in the market for their high quality. We are dedicatedly involved in providing an excellent quality array of Havells Air Coolers.